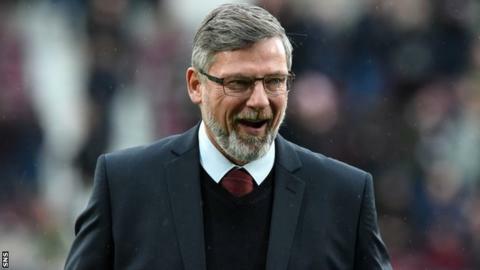 Hearts manager Craig Levein says he is only "pointing out things that are obvious"
Craig Levein has suggested Celtic's Scott Brown got booked against Kilmarnock so that he would serve a suspension before the Old Firm derby. Brown blamed his caution on the Hearts boss' comments about players needing more protection from the midfielder. "If Scott didn't get booked against Kilmarnock and got booked against St Johnstone [on 18 February] then he'd miss the Rangers game," Levein said. Brendan Rodgers says Levein appears "obsessed" with the Celtic captain. Levein raised concerns about the Celtic captain after Hearts midfielder Harry Cochrane suffering a bruised collarbone following a challenge from Brown during Celtic's 3-1 win in January. After he was booked in Celtic's 1-0 defeat at Rugby Park, Brown said of Levein: "He has done his job, hasn't he? I was booked with my first foul and that is exactly what Craig was looking to do." When asked about the comments, Levein stood his ground. "I'm not trying to irritate anybody. I'm just pointing stuff out," the Hearts manager said. "Scott Brown mentioned last week that he got booked because of me bringing attention to his proclivity to foul people. I disagree with that completely. "I'm just pointing out things that are obvious. I think you'll find that his intentions were always to get himself booked in that game so he didn't miss the Rangers game. "That sort of things happens all the time. Anybody who is sensible would look at the situation if there is a particular game they want to play in and know they need to get booked to miss a game prior to that. I did it myself when I was playing, so it happens. "I don't know Scott's intentions but I'm just pointing out the fact. That's all." Responding to his Hearts counterpart, Rodgers said: "I think it's a huge compliment for Broony that Craig keeps talking about him - especially as we don't play them for a little while. "Broony is a very competitive player... there's nothing really to answer on that."